A proposed commercial development by MFMA Development Sdn. Bhd. at Bayan Lepas. 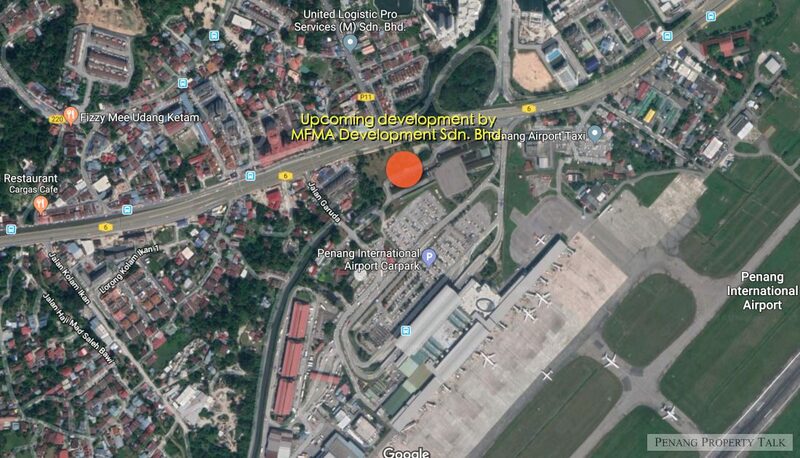 Located near Penang International Airport, next to the existing outdoor car parking area. MFMA Development Sdn. Bhd. is a joint-venture company between Mitsui Fudosan and Malaysia Airports with shareholdings of 70% and 30% respectively. The company owns Mitsui Outlet Park at KLIA. This development will see the demolition of the existing buildings, for the construction of a 3-storey shopping complex. A 7-level multi-storey carpark was also proposed by Malaysia Airports. The project is still pending for approval. It is still not clear whether this is a Mitsui Outlet Park in Penang. Developer : MFMA Development Sdn. Bhd. Finally an upscale Mitsui Outlet for Penang. Time to move the airport off the island. Encourage FTZ company to move to Batu Kawan. Flip the airport and FTZ area into tourism attraction. The more critical PTMP and airport extension also not yet approved, want to talk about building shopping mall, what a joke! This mall is private investment, PTMP and airport is gov, they are different. Kanilaobu lah! Pen need new terminal.Current terminal look like a market during pick hours. PIA really need a new international attraction that can cater for all. New multi-storey carparks can really ease the parking shortage and congestion. PIA needs to be revamped asap too. I feel ashamed when I went to PIA washroom which was dark, gloomy and feels like my old primary school washroom. We need a new international airport in the northern region. PIA will not cut it anymore. Building one in Kulim can help solve the congestion issue at PIA, help stimulate growth in the northern region, and eleviate traffic issue in Penang. I know that it will be a bitter pill to swallow, but one must think of the future and just do it. It’s not a bitter pill, it’s just dumb. There’s no need to build a brand new airport, an extension will be sufficient. The traffic is mostly budget airline, just look into that. That’s the way to maximise return on investment. You brought up a good point on the current traffic for PIA is currently comes from budget airline. We can maintain PIA as is and us it as a low cost hub for the northern region. Use Kulim as a new hub for international airport. In that way, we inadvertently will expand the economical coverage for the northern region, so that it will not be centralized only on Penang Island. Let other areas to be modernized, so that more people can share the wealth. I hope this mall will have a LRT station within as per PTMP”s plan. The airport could be expanded into man made island proposed per PTMP. The runway could be expanded into the reclaimed land in the southern coast like Kansai Int’l. Are the NGOs angry about shopping too? At the moment, Mitsui is submitting KM to MBPP(next year construction will begin) and go ahead for PIA’s multi-storey..later LRT station will be sandwiched between these 2 developments..
aeroplane has technology to detect the runway even the short runway, so mahb not require runway expansion..they only need new terminal to cater additional plane parking..